Volunteers providing free services to help you find your lost dog. Donate $5.00 & Receive a Free Tag! AAHA -Check you dog’s microchip manufacturer by using their handy search engine which will scan participating microchip companies databases: microchip lookup Once you have determined the brand of microchip call manufacturer to make sure your dog’s information is up to date! The American Animal Hospital Association (AAHA) is the only exclusive companion animal organization that accredits small animal hospitals throughout the U.S. and Canada. AVMA –the microchip backgrounder American Veterinary Medical Association (AVMA), established in 1863, is a not-for-profit association representing more than 82,500 veterinarians working in private and corporate practice, government, industry, academia, and uniformed services. 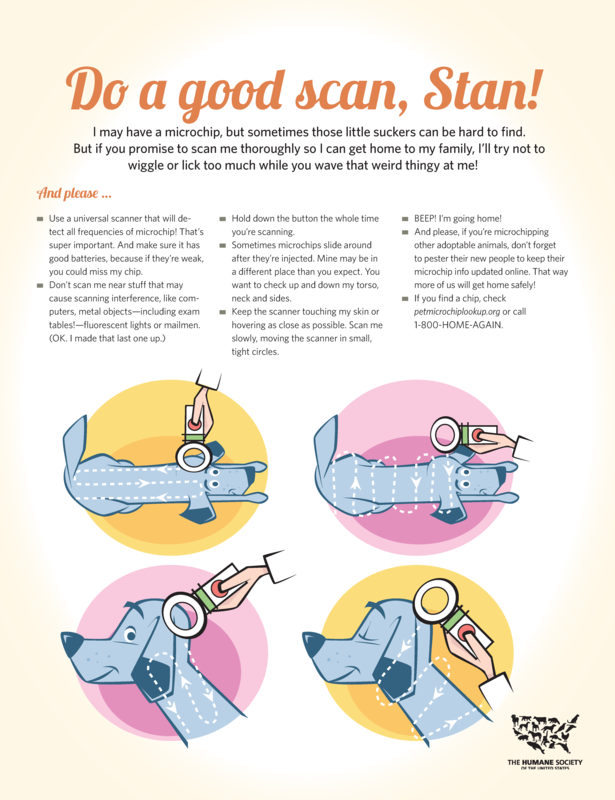 Scanning for a Microchip – Download these easy procedure guidelines to make sure you do a through scan on a dog. Dead End or Unregistered Microchip? If you have found a dog and are having difficulty navigating the system or reaching the owner please use our FREE services at www.microchiphelp.com We have a team of volunteers who will help track a dead end microchip and may even be able to help with an unregistered microchip. When It Comes to Microchips – Does Size Matter? Many styles. to choose from.